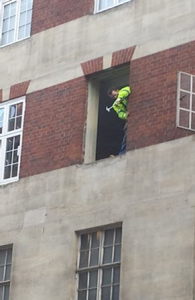 Westminster Magistrates’ Court heard that the company carried out window installation work that put their workers and members of the public at risk of suffering serious injuries or a fatality. The Health and Safety Executive (HSE) carried out an investigation into the work after a member of the public provided photos of workers leaning out of window openings eight metres above the ground. They also provided a video showing the workers dropping part of a window which fell to the ground and just missed a nearby pedestrian. The work was halted when HSE served a Prohibition Notice. The court heard the company had previously been given advice by HSE in connection with work at height and that an audit by the company’s bank had previously identified a range of relevant health and safety failings. The court heard that neither written warning was heeded by the firm. The company pleaded guilty to breaches of Regulation 6(3) and 10(1) of the Work at Height Regulations 2005 and was fined £36,000 and ordered to pay £1,386 in costs. This case highlights the absolute requirement for all working at height activities to be properly assessed, planned and implemented, using the correct access equipment. It is vital that people are trained and competent, not only to undertake the practical work on site but also when planning working at height activities. It is our experience, that in too many cases, safety method statements and risk assessments are poorly documented using ‘generic’ type documentation. One other item to note is that a member of the public saw this activity and contacted the HSE. With modern communication equipment this is becoming a more common occurrence.